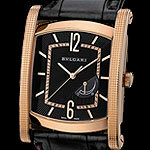 Of all the luxury watch brands Bulgari is the one who's sophisticated style and unique class never fails to impress me. Their designs are simple, elegant, and precisely executed best of with only the best of materials. After all the over the top creations I've seen lately it was refreshing to say the least to come across the latest addition to Bulgari's Assioma watch collection, the Reserve de Marche, a watch that indeed has the distinctive Assioma style. While the Reserve de Marche's design is simple at first glance, on a closer inspection of the watch you see the time spent on the smallest detail. The 18 carat gold case is adorned with a beautiful hobnail pattern on both sides of the case and the black dial has a sunburst guilloche pattern. The case shape is the brands Assioma style, a signature of the house of Bulgari. The strap is in alligator leather and has an 18 carat gold buckle. Beauty as they say is not only "skin deep" for the Reserve de Marche, it is equipped with a sophisticated ultra-thin manual winding movement that is only 2.8mm in height. The manually wound movement features a power reserve complication which indicates the state of mainspring tension.